According to the report of Transparency Market Research, the global vacuum packaging market has highly consolidated vendor landscape. Some of the companies operating in the vacuum packaging market are Sealed Air Corporation, Amcor Limited, Mondi Group, Bemis Company, Inc., Berry Global, Inc., and Wipak Group. These players collectively accounting for higher share in the global vacuum packaging market. These companies are increasingly opting for business strategies like acquisitions and mergers which is leading to further consolidation of market. However, high number of new entrants in market, can lead to fragment the competitive landscape of market. TMR predicts, the global vacuum packaging market was valued at US$15.0 bn in 2015, and is predicted to attain valuation of US$22.8 bn over the forecast period from 2016 to 2024 by rising at a CAGR of 4.9% over the forecast period. Based on material type, the polyethylene (PE) segment is dominating the global market for vacuum packaging market. This segment accounted for 38% of total market share in 2016 and expected to remain dominant over the forecast period by expanding with 4.6% of the CAGR over the forecast period from 2014 to 2024. Increasing consumption of packaged and processed food coupled with growing awareness toward the hygiene and food safety is fuelling growth of the market. Additionally, rising disposable income coupled with willingness to spend for processed and hygienic food are supporting growth of the market for vacuum packaging. Additionally, the factors such as growing demand for vacuum packaging from food and beverage industry owing to its advancements and advantages in packaging. These packaging systems are able to preserve the food for long time owing to its proper grip. 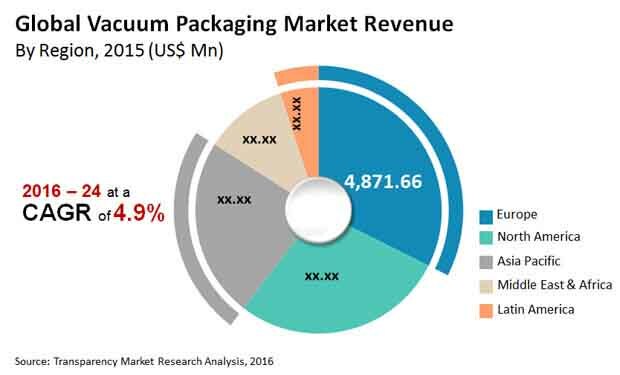 These factors are fuelling growth of the vacuum packaging market. Additionally, demand for vacuum packaging is growing from the pharmaceutical industries is another factor influencing growth of the global vacuum packaging market. Despite these factors, high cost of vacuum packaging limiting growth of the vacuum packaging market. Nonetheless, many market vendors are focusing on the product improvement for making an offer of innovative solutions on effective packing. The advancements in the products are solely aimed at catering to the functional needs of end-users, mainly in the beverages & food segment. Additionally, a large chunk of end users are increasingly designing specializing the innovative solutions are offering growth opportunities over the forecast period.